Next week will mark our sixth show since starting the app. That is a big deal to us because from the beginning we always said "let's just give it six shows." The last year and a half have not gone as we expected. There have been lots of twists and turns. We've had times we wanted to give up and times we felt like like we were almost at a tipping point. Going into this show, it's safe to say things are looking up! Wilma is coming back to the show! 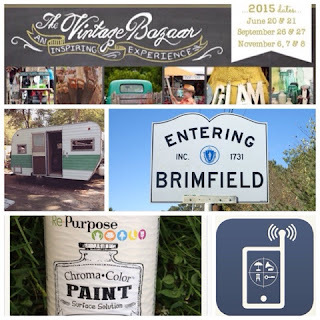 Brimfield appearance at the July 2015 show. Our vintage camper will serve as our base of operations for another show. In July we had a great spot on Hertan's. We loved being there and enjoyed the shade, the friendly atmosphere and the best port-a-potties in Brimfield. We can't thank Dave Lamberto enough for his generosity and everything he does to run such a well-managed field but also his leadership within the Brimfield Promoter's Association which helps the entire show. He has been one of our biggest supporters and we really appreciate it. But for the September show, we will be setting up on the Central Park field in a prime shopping area! This will give the app a lot of visibility. We expect it to increase downloads and give us an opportunity to meet and talk to many more users. We love the idea of being right in the middle of all the action. And on a personal note, since I'm on no sugar/low carb health kick I'm super pumped that we will be right next to Hearty Eats and BTs Smokehouse all week! Opening day is a little extra special for us this year! Charlotte's first day of pre-school is Tuesday September 8th. Of course it is, right? And of course she only needs to go for one hour in the middle of the morning! Some things take precedent over Brimfield though, and this is definitely one of them. I'm so excited for her and also an emotional wreck about the whole thing. Wish us luck! was born! I even found out I was pregnant with her at the show! We are now partnered with brimfield.com! Brimfield.com is the premier Brimfield website with millions of hits per year. It is the leading online source of information about the antique show. The site is now helping to promote the app by recommending it to readers as an excellent resource for navigating the show and as a way to find specific items and dealers. We are so excited about this and have already seen a significant impact to our site traffic from this. It's a win-win for everyone! A new version of the iPhone app is now available! The new version fixed a few bugs, added a link to our Instagram gallery, made some cosmetic changes to dealer listings, put search results in alphabetical order and added our contact info. We are very happy with our iOS developer/coder after a horrible experience with our previous one earlier this year. It's such a relief to work with someone who is professional and responsive! Sadly however, we are now 5 for 5 with developers committing to fixing the Android version, supposedly working on it for weeks, and then disappearing off the face of the earth. So Android users, please bear with us as we continue working to improve it. A little over 80% of our downloads/users are on iPhones, so that has always been our priority but we are determined to have a bug-free Android version by May. So that's a little bit about what's happening on our end of things. I know many of you are equally busy with Brimfield prep, back to school and Labor Day activities. We are looking forward to a really strong show and keeping our fingers crossed for some cooler weather next week! Today was the big day. 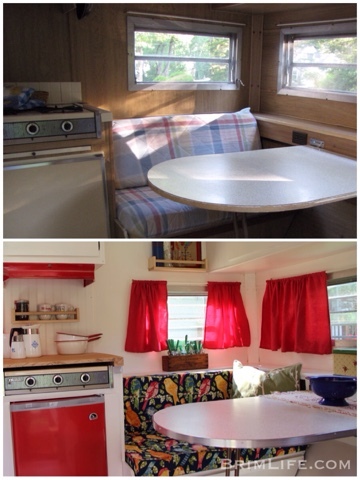 More than two and a half years after purchasing our vintage camper, Wilma made her first post-renovation appearance. A week ago I was pretty sure we had bitten off more than we could chew and she wouldn't be done in time but we pushed through and got her done. 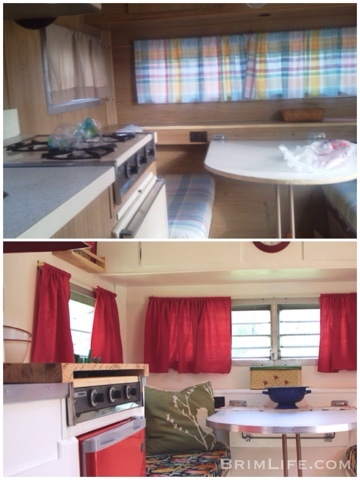 We dropped her off in Brimfield yesterday and today we spent the day at the field getting her prettied up. This was the first time we got to see our new awning in action and how all of the pieces came together. It was really satisfying to see all of our hard work paid off. Despite the heat, it was a pretty fun day! I had planned on doing a full post with all the details of our renovation but that's going to have to wait until after Brimfield. For now, you'll have to settle for some before and after photos. Isn't that the best part anyway? Here she is in the condition we bought her in back in 2013. In fact, these are the actual photos from the craigslist post we responded to. As you can see, we made some pretty significant cosmetic changes to the interior and exterior. And here are some side by side before and after photos (mostly of the dining area) which were really fun for me to look at. One of the biggest changes we made was painting the entire interior a creamy off white. I love how much it brightened up the whole place! 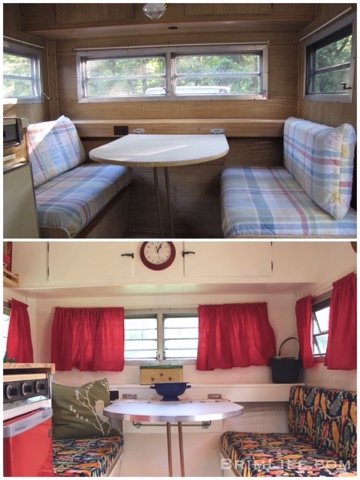 I've seen beautifully restored campers with the original wood refinished but this was all fake paneling and painting it was definitely the way to go. We also replaced all the curtains and cushions and I'm so happy with how they turned out. Since I can't sew to save my life, my mom is responsible for those. She did an amazing job! Originally, we had planned on replacing the formica counter and tabletop but that didn't happen and I think it was for the best. It was in great condition and I actually love that it's original. We did put a new metal edge around the table (and countertop) which cleaned it up quite a bit. We also replaced the ice box with a new fridge. That made the most sense for us, especially with two young kids. You can also see the butcher block stove top cover we made. It's one of my favorite things we did because it gave us so much more useable counter space. In the picture below, you can see that we took down a light between the upper cabinets and replaced it with a clock. There is another overhead light above the table (out of frame) and we decided that was going to be enough light. The one between the cabinets was gas powered and kind of scared me (probably unjustifiably) so we took it out and the clock covered up the holes perfectly! Once things settle down a bit I would love to share more details of the renovation, but I hope you enjoyed seeing the overall transformation. It's amazing what a little paint (and fabric, accessories, construction materials, hard work, tears, time and sanity) can do! And if you are going to be in Brimfield this week, come see Wilma in person and say hello! She's set up at Hertan's right on the side of Mill Lane. I hope to see you there! Thank you to the good home and Juniper Vintage for providing some of the great accessories in these photos! Welcome to Life to the Brim! Well, this is it. My very first blog post on my very first blog. I'm going to start with a confession. I don't follow a ton of blogs. I have no idea what people say in their initial posts. I was going to do some research to find out but then I decided I would just wing it! I didn't want to overthink it or have a strategy. So here it goes! This blog will be a place where a lot of my interests intersect. Will it be too general? Possibly. But if you are interested in Brimfield, vintage and antiques, home decor, cute kids, DIY projects, New England, vintage campers, food or nice people, you will probably like it. I hope you do! I came up with the name for the blog because I think it's fun play on words. Brimfield is a big part of our life these days. That's for sure. But our life is full to the brim in so many other ways. It's full of beauty. Full of building memories. Full of long term plans and short term obstacles. Full of parenting successes and fails. Full of figuring things out as we go. We are always trying to get the most out of everything we do without losing sight of what we already have and we have two precocious girls who keep us in check. They simultaneously make time speed up and force us to slow down. We are just a few weeks away from switching over to full Brimfield mode again (how did that happen already?!). Summer hasn't even officially started yet but it already feels like it's flying by. We have so much going on and it gets crazy (to say the least) at times but our life truly is full to the brim in so many ways. I hope you enjoy hearing a little bit about our adventures and will follow along or stop by now and then to check in! Detailed Brimfield Dealer Profiles of some of our favorite dealers just in time for the July show!